Cost: $75 - good for one year from date of purchase. 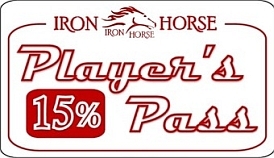 The pass allows for 15% off green fees and all in stock merchandise. Pass is valid 7 days a week, when course is available. The pass may only be used for golf fees for the person it was issued to. The pass can be used an unlimited amount of times during the one year period. Management may revoke privileges of this pass in case of abuse.